Me: Hi, my name is Emily. New friend: Hi Emily, what do you do? These interactions usually leave me feeling like an imposter, because there are too many insects in the world, too many in our backyards even, to know them all. Plus, observation is the step of science I’m not so good at; usually I’m thinking about World War II or that great rice pudding I had the other night instead of what’s under my feet. Nowadays, I try to be more observant when it comes to insects. My best bug hunting happens during morning jogs, especially this time of year when cold-blooded animals are basking on the pavement to avoid the guillotine of winter. 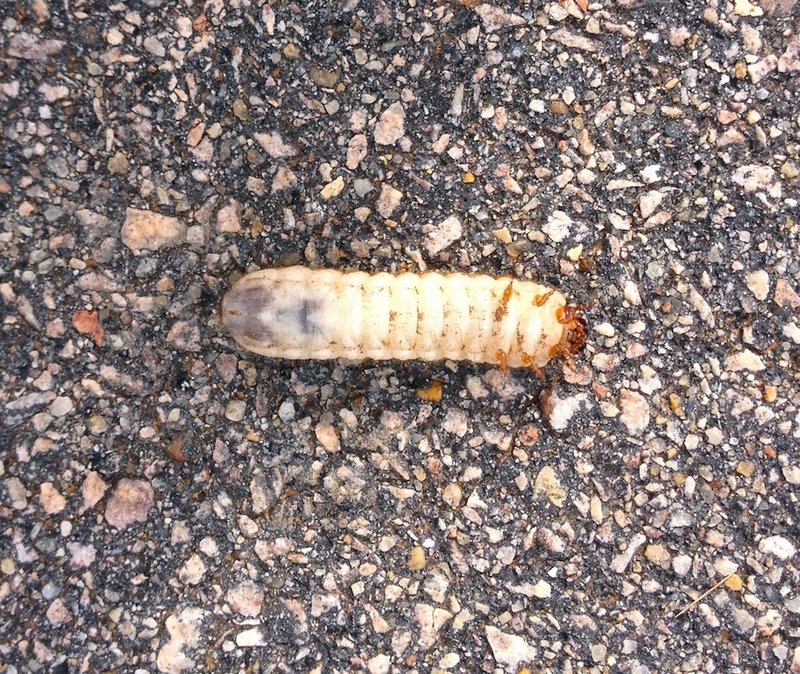 Last week, I stopped running to stare at the strangest thing: a fat, milky beetle grub scooting across the pavement on its back. I thought maybe it was infested with a parasite, but the grub looked healthy, and what parasite would benefit from a beetle doing what looked like an adorable dance move, or a very uncomfortable yet inventive leg of a relay race? It turns out this grub morphs into a beetle you might know, the green june beetle, who spends its entire life under, or buzzing just above, your grass. 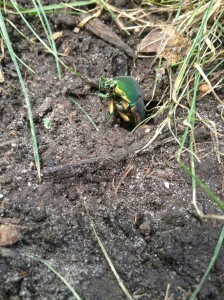 The adult beetles are velvety green outlined in metallic tan. As you can imagine, the grubs are less easy to identify, at least until you watch them scoot, which is how scientists tell them apart from other beetle grubs. They’re the only ones in the southeastern US that travel upside down. This means that somewhere, sometime, in the history of this beetle’s evolution, there was a mutation that caused a grub to crawl on its back. And that grub and its progeny survived and reproduced better than their brothers, sisters, and friends. 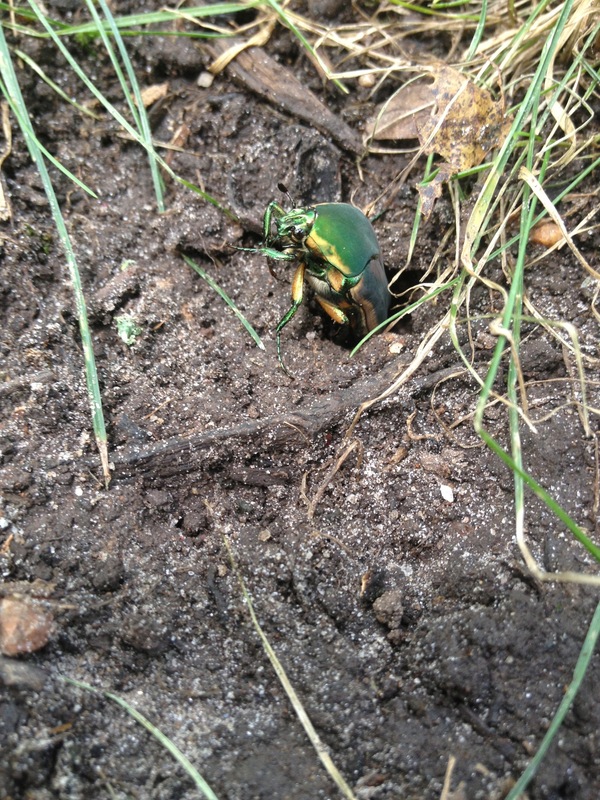 And now all of the green june beetle grubs travel the world (well, the US, at least) belly up. But why did this weird behavior evolve? Scientists think it’s because the green june beetle’s legs are useless. They’re too small, and the beetles are too chubby. What are useful, though, are the ridges and hairs along the top of its body, which the grubs use to gain traction to move across the pavement, under my feet, and, now, across your computer screen.